Do you allow your pets on the furniture? If you do you’re well aware of how hard is to keep them clean. My favorite tip for keeping your furniture clean and fur free is to use a cover. You can use sheets, blankets or slip covers — and if you want something to match your decor you can get them custom made. When it’s cleaning time you just throw those covers in the wash & you’re good to go. Looking for a simple way to pick up some of that dog hair? Use dryer sheets. They pick up loose dog hair on fabric like magic. Just rub a dryer sheet over your couch or wherever else pet hair collects and watch as it clings right to it. Does your dogs hair get everywhere, or is it just me? 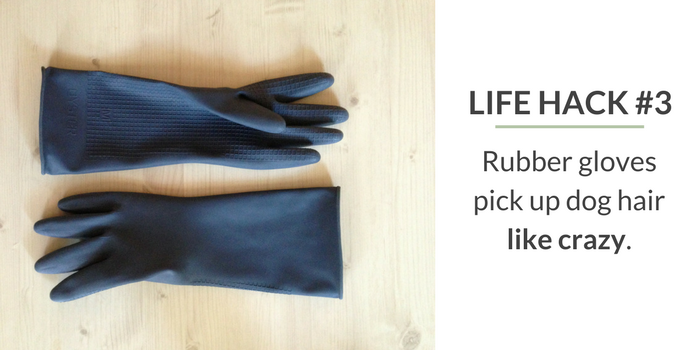 My favorite method for picking up all that loose hair is using a pair of rubber gloves. You put them on and run you hands over your furniture; it’s amazing how well pet hair clings to rubber gloves. Use a pair of rubber gloves to pick up dog hair like crazy. Does your drool a lot? If so you’ve probably got a bunch of drool marks all over the house. You can say goodbye to scrubbing off those drool marks by getting yourself some magic erasers. Do you have some dog odors you want to get rid of? If you don’t have any special products on hand don’t worry – you can make your own simple dog friendly carpet deodorizer with items you’ve got around the house. When you bathe your dog does their hair end up clogging up your drain? Use a baby wipe to help stop the dog hair from clogging it up. Want to give your dog a nice comfy spot to sleep without having to buy a dog bed from the store? Make them this super cool dog bed out of a sweatshirt & pillow. Do your clothes pick up dog hair like crazy? Don’t have a lint roller on hand? One of my favorite life hacks for dog owners is using packing tape to pick off all that dog hair that gets all over your clothes. Don’t have a lint roller? A roll of packing tape can pick up dog hair from your clothing. Does your dog go straight for the littler box? He’s not alone, lots of dogs are attracted to kitty litter. Keep your dog from getting into the litter by elevating the box, creating a barrier around the box, or by using a covered litter box that your dog can’t get into. 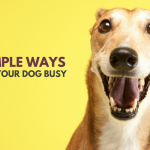 Looking for a simple way to keep your dogs mind busy? Create a simple puzzle toy with a muffin tin, treats and a few tennis balls. 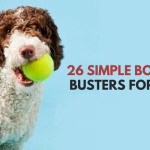 And if you’re looking some more boredom busters check out 26 simple ways to relieve dog boredom. Does your dog like to chase stuff? Take advantage of that natural instinct and teach your dog to chase bubbles for some easy playtime & exercise. Stuff a Kong with some yummy treats to keep your dog occupied, and for a tougher challenge you can freeze them in there. You don’t need fancy dog treats or stuffing either – here’s 39 food & treats I like to Stuff in Kongs. 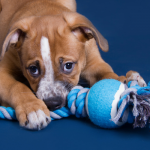 Does your dog love to play tug? Got some extra t-shirts lying around? Make your own toy by braiding one of your old t-shirts into a tug toy rather than throwing them out. Make a flirt pole for dogs that love to chase and/or have a strong prey drive. Just remember to take it easy with this exercise since it’s pretty high impact and can be tough on a dog’s joints. Does your dog go bonkers with stuffed toys? If your dog likes to rip stuffed animals apart you can make a re-stuffable dog toy. Does your dog enjoy the water? Keep your dog cool in the summer by using a plastic kiddie pool out in the yard. They’re inexpensive, too. I got ours for about 4 bucks at my local Meijer. Does your dog love the water? Buy them a kiddie pool for the backyard. If your dog loves to dig keep you can keep your garden safe by teaching them to use their very own digging box. Looking for an easy way to keep your dog busy? Make them some frozen dog treats. Freeze some broth in ice trays to give your dog a nice little treat on those hot summer days. Just like us dogs get bored with new stuff after awhile, and this includes their toys. Keep their interest by alternating their access to them. Once your dog hasn’t seen their blue ball in a month they’ll have a brand new appreciation for it the next time it makes an appearance. Does your dog get bored with their toys? Try alternating them to keep their interest. Do you think you dog has fleas? Have them lay on a white towel while you examine & brush their fur. The sheet makes it easy to see any loose flea dirt that falls from your dog. One of the most useful life hacks for dog owners is finding a way to get your dog to swallow pills. If you’re having a hard time getting your dog to swallow pills you can make your own DIY pill pockets. Don’t have a tick remover on hand? You can carefully remove ticks from your dog with a pair of fine tipped tweezers. Grab the tick by it’s mouth area (the part closest to your dogs skin) and pull firmly until it’s removed. Place the tick in a jar of alcohol to kill it, and be sure to wear gloves when dealing with ticks since they can transmit diseases to pets & people. Does your dog have a hard time eating his kibble? If your dog has sensitive teeth you can soften up their dry dog food by adding in some warm water. Dog food can start to loose it’s freshness after it’s open. If you buy bags of dog food use an airtight sealed container to store it, the food will stay fresh for much longer inside a tightly sealed container. Don’t have any dog treats on hand? You can make your own simple & healthy dog treats. Here’s 21 dog treat recipes you can make, all with 5 ingredients or less. Get in the habit of brushing your dogs teeth daily to avoid expensive dental visits later. 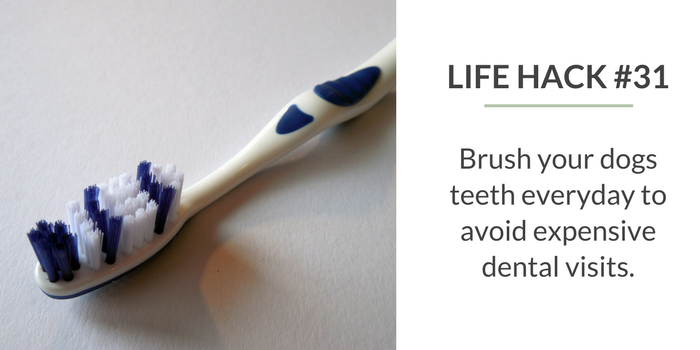 You can use a human toothbrush if you like (though they make ones for dogs, too), but be sure to pick up tooth paste that’s formulated for dogs. Regularly brushing your dogs teeth can cut down on expensive dental visits later on. If your dog doesn’t like having his teeth brushed squeeze some doggie tooth paste onto a rope toy & let them go at it. It’s a nice way to start desensitizing them to having their teeth brushed. 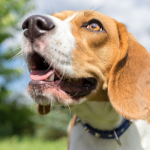 Does your dog have arthritis or weak limbs? If your dog needs some extra support getting up & around you can make your own dog sling to help. If you need to collect a urine sample check out this awesome $2 solution (a ladle & small containers) that makes it easy. Did your dog get skunked? You can get rid of that nasty skunk smell from your dog using some soap, peroxide & baking soda. 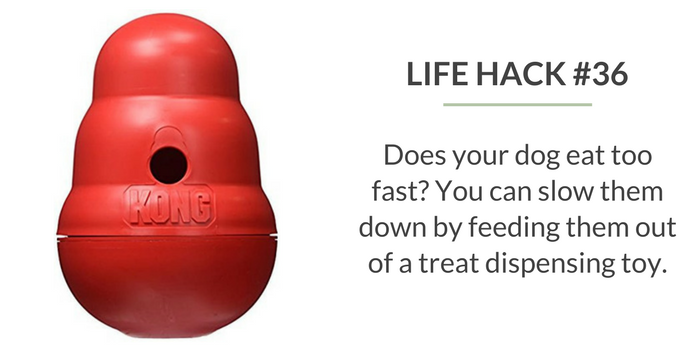 If your dog eats too fast use a food dispensing toy (we love the Kong Wobbler & Bob a Lot), or place a few tennis balls in their bowl to slow their eating. Not only does this keep them from eating too quick, it gives them a nice mental workout. If your dog eats too fast use a treat dispensing toy for meals. Are you filling up your dog water bowl multiple times a day? Create your own DIY refillable water bottle bowl. If you don’t have any paw balm, and if your dog doesn’t like wearing boots, you can use some Vaseline to help protect your dogs paws in the winter. You can make your own elevated pet food bowl with an $8 table from Ikea. Elevated food bowls make eating easier on dogs with arthritis and joint problems since they won’t have to bend down as much. When you try to pick out a stinger from your dog you risk leaving part of it in the skin. Remove stingers by scraping them with a straight edge – like the side of a credit card. Did you cut your dogs nail too short? 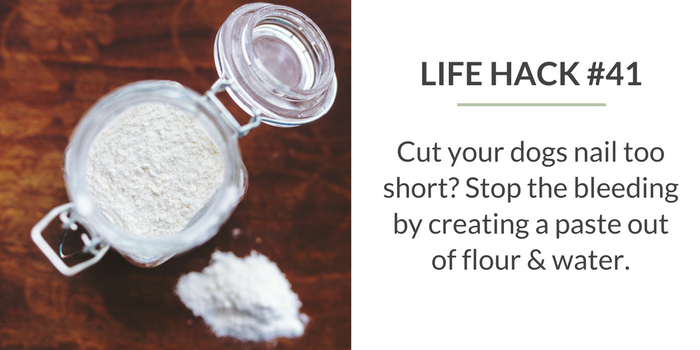 Use a homemade mixture of flour, baking soda or cornstarch with water until it’s a thick paste then apply it to the nail with moderate pressure for a few minutes. If you cut your dogs nail too short you can stop the bleeding by creating a paste out water & flour. If your dog pulls on his leash get a harness that clips in the front. The harnesses that clip on the back promote more pulling. And when you’re working on leash manners ditch the retractable leash for a regular 6 foot one so your dog can get the feeling of what loose leash walking means. When training your dog to “come here” make sure you’re giving out a lot of praise & treats. The goal is to make coming back to you the best decision they could have made, if not your dog is likely going to decide that whatever he was chasing/sniffing is more interesting. Don’t have any dog treats on hand? 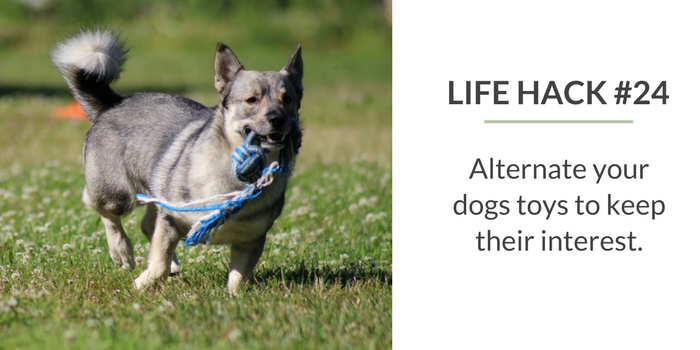 Use some leftover fruits & veggies that are healthy for dogs as your training treats. Carrots and snap peas are Laika’s favorite snacks. When potty training your dog make sure to pay attention & praise them every single time they do their duty outdoors. If you treat every pee & poop outdoors like it’s the best thing that ever happened they’ll catch on pretty quick. Instead of just giving praise for a new trick add some yummy treats or a game of tug as the reward. By changing the rules & rewards you’re keeping training sessions more fun & exciting for both you & your dog. If your dog doesn’t know how to catch don’t start by throwing a toy at their face. 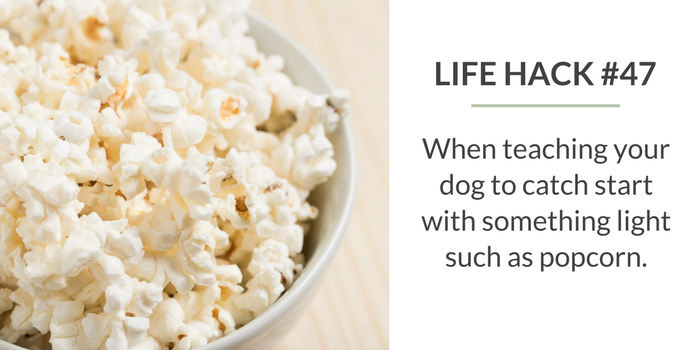 Popcorn works great for training dogs to catch because it’s light & yummy which makes it enticing enough for your dog to try and catch it. When training your dog to catch start with a light snack such as popcorn. Having trouble being consistent with giving out praise at the right time? Start clicker training to make marking their good behaviors much easier. Make sure both you & your dog stick out if you’re going to be out walking during hunting season. You can wear bright colors (orange is preferred), and you can help keep your dog safe by having them wear a bright orange bandana. There are 4.5 million dog bites in America each year, half of which happen to children. Make sure to teach your children to ask permission before petting any strange dogs. Don’t approach a strange dog just because it’s wagging it’s tail. Tail wagging isn’t always the universal sign of happiness – it can also indicate fear or insecurity. Be sure to teach your children about the basics of dog bite prevention. An estimated 100,000 dogs die each year from riding in pickup beds each year, and that doesn’t take into account all of the injuries seen each year. Dogs in pickup beds are also at risk of being hit with debris that can cause injuries. While it may seem obvious to keep your cleaning products tucked away safely one of the biggest threats to a dogs health in your home is the garbage. If your dog gets into the garbage you can use some baby proof locks to seal it, or put it away in the closet or garage while you’re gone. 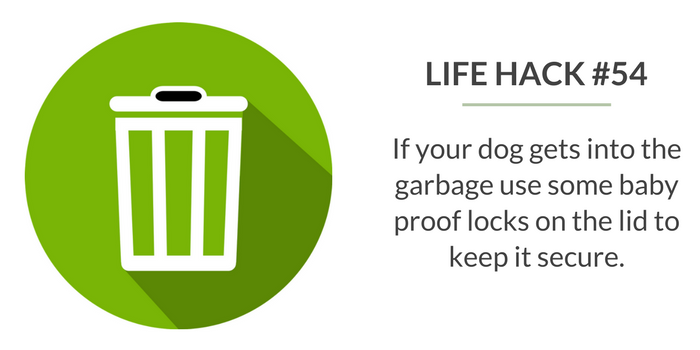 If your dog gets into the garbage you can keep them out by using baby proof locks or putting the garbage out of reach when you’re away. I know that dogs love sticking their head out car windows – but it’s a dangerous habit. They’re at risk for being hit with debris, damaging their ears & there’s always the risk that they’ll see something & jump out. If you’re going to be driving over 20 mph it’s always recommended to have your dog restrained in the car. You never know when an accident might happen so it’s recommended to have a first aid kit on hand just in case. Here’s a great list of basic items a pet first aid kit should have. Many gums & candies include xylitol, a sugar substitute that’s highly toxic and can be fatal to dogs. Keep all candies and gum far out of reach of your pets at all times. Here’s a list of common household items that are known to contain xylitol. Hot pavement can burn your dogs paws rather quickly. To see if it’s too hot for your dog place the back of your hand on the pavement – if you can’t hold it there for 5 seconds it’s too hot for your dog. On really hot days consider walking your dog in the woods, on the grass, or waiting til the sun goes down. Not all dogs are great swimmers, and when it comes to pools they can be very dangerous for a dog. 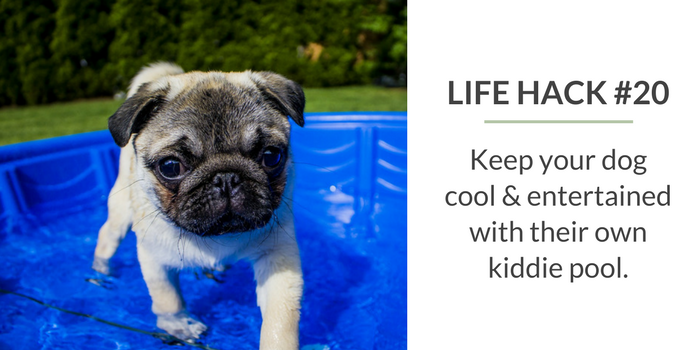 Keep an eye on your dog if they’re out in the yard by the pool and make sure your dog knows where the steps in & out of the pool are. What Dog Care Tips & Life Hacks Do You Use With Your Dog? Have you used these any of these methods yourself? What other tips & tricks did I miss? What are your favorite life hacks for dog owners? OMD! These are AWESOME!!! I had to pin it so I can refer back to this over and over! Didn’t know that baking soda is so awsome! These are some great tips and tricks, some I knew, some I use, some I didn’t know! I love the idea of putting the doggy toothpaste on a rope bone, what an excellent way to get those molars. With the sealed container for dog food, you have to wash it every time you refill it, because the oils in the dog food stick to the sides and go rancid or break down the plastic. all of these are very useful tips, I can bet every parent paw will find this extremely useful, especially for me as well. thanks Jen, the list is really awesome!!! i’m a big fan of DIY and your list is amazing for this purpose. especially i like No6 – how to cover up scratch marks with a walnut. it really works! thanks for huge job done and for sharing! to add one more trick of using baking soda: sprinkle a thin layer of baking soda in the litter tray before adding litter and it should help keep any smells under control between litter changes. Great list! My dogs love fresh fruit and veggies as treats. Wow Jen these tips are amazing so glad Iv found your posts, love the ideas so simple but so effective, I have a 6 month old Portuguese Water Puppy, love her but it really is soooo much hard work. Will defiantly get my kids to try the popcorn trick they are desperate to try teach her to catch..lol. The DIY flirt pole link is broken or no longer available. I was excited about that one! I like this list and I’ve read through it on multiple occasions. Cold rainy day yesterday where I live and Dylan, who loves spending time in his fenced-in yard, was obviously bored and looking to get into something. So I used a modified version of tip # 24 and showed Dylan all of his toys at one time in a storage container that he could easily get in and out of. Some of the toys he hadn’t played with in months. He was like a human kid on Christmas morning. He spent almost two hours, going through his toys and scattering them all over the house. But it kept him entertained. Now I want to teach him how to put them all back. This will be a challenge, no doubt. I love that idea, and it really is wonderful how excited they get with those toys after they’ve haven’t seen them in a while. 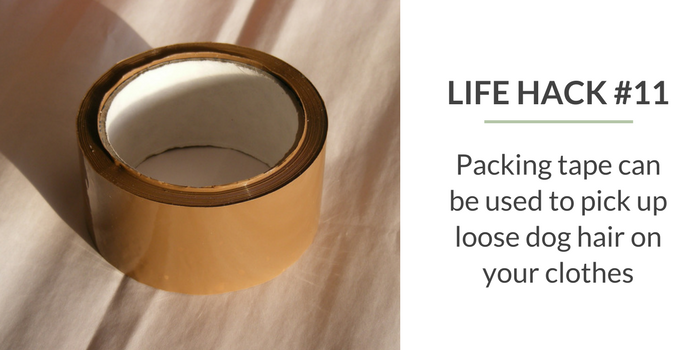 Another tip for ticks… If you don’t have a container of alcohol handy you can stick them to a piece of tape. When you’re done removing ticks, fold the tape over or cover it with another piece of tape. Then you can just throw it in the garbage. For times when I cut my dog’s nail too short, I keep a styptic stick with the clippers. Wow, seems like you’ve covered all of it! Thanks for sharing the great tips! Especially all of the getting rid of dog hair! There are so many long haired dog breeds. I don’t think Vaseline on the paws is a great idea. My dogs would lick it right off and dirt, grass, etc. From outside would stick to it. Thanks for an amazing list! 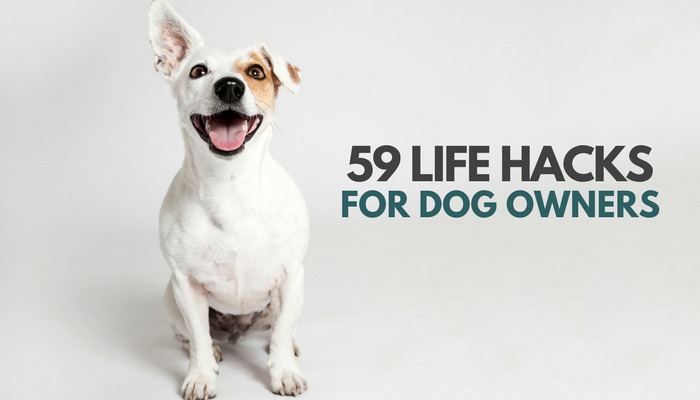 I also applied some of the tips here to my 3 rescue dogs: Lisa, Sofie, and Winston. I have never seen 59 Fantastic Life Hacks together before. All hacks are very important for dog lovers, especially those who want to keep their dogs and their houses clean. Most of your hack is about keeping the house clean and dog care. Dog fur can really cause difficulties, especially dogs that leave more fur. The dog’s urine can create a stinky smell inside the room, but there is also a way to escape from it. You have mentioned some methods but did not talk about the dog’s vacuum cleaner. It’s really helpful. Overall it’s a great post. Thanks!